Founded in 1989 by Uli Behringer, the Behringer Company is a comparatively new player in the audio equipment market. And although never really regarded as a high-end manufacturer, Behringer has strived over the years to put out products that are both effective and affordable; especially with their recent lines of guitar amplifiers. 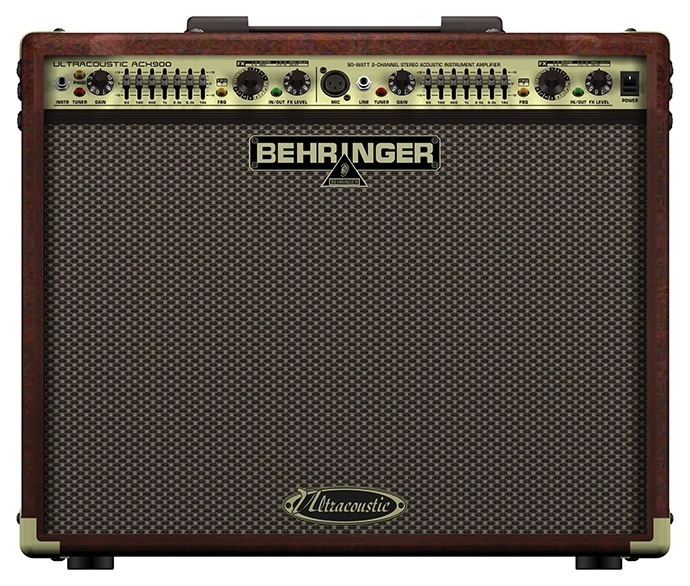 Of these, the Behringer Ultracoustic ACX900 is the 90watt member of the company’s Ultracoustic series of acoustic guitar amps. Today we take an in-depth look into the pros and cons of this amp. One thing that we really dug about the ACX900 at first glance was its brown vinyl vintage look. Don’t get us wrong, we know that at the end of the day, looks don’t mean much. But if you’re a gigging guitarist, it’s nice to have an amp that looks the part. The amp is also sturdily built and feels like it could take some rugged road treatment. As far as portability goes, the Behringer ACX900 isn’t the handiest sized amp, but measuring 16.8 x 9.5 x 20.7 inches and weighing in at just a little under forty pounds it’s perfectly manageable for a solo musician. A pretty cool feature of the ACX900 is that it has two channels, one for a standard ¼” input and another for a ¼” and XLR input, both with independent seven-band equalizer controls. This makes this amp ideal for solo guitarists who play smaller venues and gigs with a one guitar, one vocalist type setup. The only difference between the two panels for the two channels is that the panel on the left has a phase correction switch which can be used to change the phase of the guitar input to match that of the microphone input. 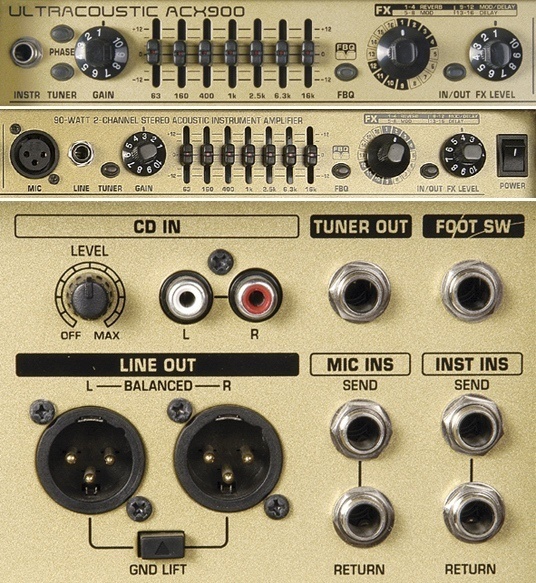 Other than that, the panel’s for both channels also include identical gain knobs, FX selection knobs, FX level knobs and switches for Behringer’s unique Feedback Detection System which automatically detects and cuts out any feedback that might occur. The amp also has two cut-off switches and a rear output for a tuner, which makes tuning up in a live environment significantly easier. The amp’s rear panel also includes a CD input which can be useful for guitarists who perform at pub gigs, and need to play music during breaks. Players also have the option of connecting an external effects processor via the 1/4” INST INS SEND and RETURN jacks. The ACX900's sound is delivered through two 8” dual-cone Bugera speakers, which manage to pack quite a punch without compromising on the integrity of the sound amplified. However, a drawback that must be mentioned with this amp is that the 16 effects which include various reverb, delay and modulation effects aren’t really on par with the effects that you could get out of a guitar processor. However, if you use a high quality external effects processor or only want to capture and amplify the sound of your acoustic guitar, the Behringer ACX900 does a commendable job. In all honesty, the ACX900 isn’t an amp for guitarists who are looking for a high-end, high-quality acoustic guitar amp. But if you’re requirements stop at functionality and affordability, this amp is definitely worth a try.